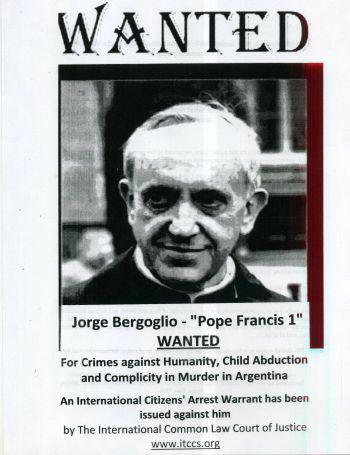 On August 4, 2013, the Brussels-based International Common Law Court of Justice (ITCCS) declared Pope Francis (Bishop Jorge Bergoglio) a war criminal. “I don’t agree with your presumption that Popes and Kings cannot be judged like other men, or are incapable of wrong (infallible). If there is any presumption, it’s the other way, against the holder of power. There is no worse heresy than that the office sanctifies the holder of it. Power tends to corrupt, and absolute power corrupts absolutely. Historic responsibility must therefore make-up for the want of the legal responsibility,” said the Presiding Magistrate while issuing a warrant of arrest for Pope Francis I. Watch a video below. This is not a good news for Israel and Jewish Lobby PR, which had declared him a kosher Pope. Pope Francis has accepted Israeli president Shimon Peres, another war criminal, invitation to visit Israel next year. “Truth must be said, I do admire fierce President Ahmadinejad almost as much as I despise war criminal Shimon Peres,” said Gilad Atzmon, an Israeli-born Jewish writer and author, September 25, 2008. Pope Francis is being accused for crimes against humanity, child abduction, and complicity in mass murder as the leader of Catholic Church in Argentina in the 1970s. On August 5, 2013, daily The Scotland reported that the secret archives of Catholic Church in Scotland could contain allegations of sexual abuse by as many as 100 priests and other staff in cases stretching back 50 years. On March 14, 2013, Mike Rivage-Seul, former Catholic priest and author, wrote at his blog that Pope Francis is bad news for Argentina – as Pope John Paul II was bad news for Poland. “We have exemplified in the case of the new pope the very same syndrome that has been universally descried in cases of pedophilia. It is the same syndrome that plagued the tenure of Benedict XVI and that possibly evoked his own resignation. It’s the Old Boys protecting their own,” wrote Mike Rivage-Seul. I bet ITCCS will never dare to convict hundreds of Jewish rabbis and other officials who have been caught in act of sexual child abuse.